Reel Talk Online: "Despicable Me"
"We are going to pull off the TRUE crime of the century... we are going to steal the MOON!" Don't you hate when you're the baddest villain in the entire universe and some yuppie (and younger) villain tries to steal your thunder? Yeah, so does Gru, the most hated evildoer ever to step the face of the earth. He gets knocks off his pedestal when Vector, the newbie villain in town, intercepts his plan to steal the moon to remind people who's really boss. Gru goes through desperate measures to reclaim his throne as the most deplorable man in all the universe--even if it calls for using three innocent orphaned girls--in the new flick Despicable Me. Gru was never able to impress his mother during his long history of badassness, until the day he came across three little orphans who helped him concoct his greatest scheme--unbeknownst to them--and changed his wilted heart in the process. With the help of his trusted yet decrepit sidekick scientist Dr. Nefario, and a host of teeny tiny (and trouble-magnet) minions, Gru's latest venture sends him back on top. 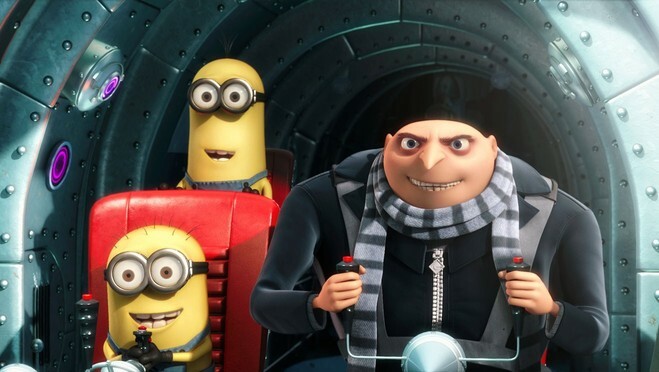 Gru is voiced by a cast of hilarious actors, including the barely recognizable funnyman Steve Carrell, Jason Segal (as Vector), Russell Brand (as Dr. Nefario), and Kristen Wiig (as the horrid Miss Hattie, orphanage owner). Charming, touching, and surprisingly funny, Despicable Me showed one man's journey to being the most hated to finally finding love--thanks to three little girls. Despicable Me is anything but despicable. Your review makes me want to see this movie now Candice!